A denture is a removable replacement for missing teeth. It is made of acrylic resin, sometimes in combination with various metals. 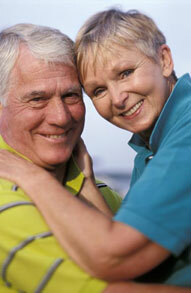 Removable partial dentures are often a solution when several teeth are missing. The denture process takes about one month and five appointments: the initial diagnosis is made; an impression and a wax bite are made to determine proper jaw position; a "try-in" is placed to assure proper color, shape and fit; and the patient`s final denture is placed, following any minor adjustments. The denture is completed at the dental laboratory. A mold of the wax-up denture is made, the wax is removed and the remaining space is filled with pink plastic in dough form. The mold is then heated to harden the plastic. The denture is then polished and ready for wear. At first, you may be asked to wear your denture all the time. Although this may be temporarily uncomfortable, it is the quickest way to identify those denture parts that may need adjustment. If the denture puts too much pressure on a particular area, that spot will become sore. Your denture can be adjusted to fit more comfortably. Dentures should be worn all day and night and only removed after meals for cleaning. It's best to stand over a folded towel or a sink of water when handling your denture, just in case you accidentally drop it. Brush the denture (preferably with a denture brush) daily to remove food deposits and plaque, and keep it from becoming permanently stained. Avoid using a brush with hard bristles, which can damage the denture. Look for denture cleansers at your local pharmacy. Pay special attention to cleaning teeth that fit under the denture`s metal clasps. Plaque that becomes trapped under the clasps will increase the risk of tooth decay. Many toothpastes are too abrasive and should not be used for cleaning dentures.